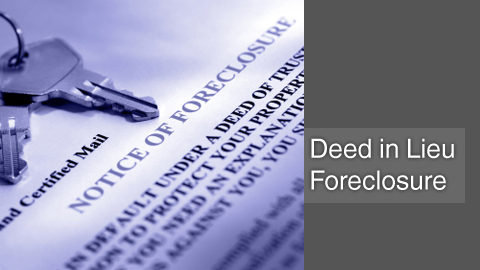 A deed in lieu of foreclosure is a deed executed by a borrower and given to the lender in order to avoid having the lender foreclose. Once accepted, the borrower is immediately released from most, if not all, of the personal indebtedness associated with the defaulted loan. The debtor avoids having a notice of default filed against him or her and saves the time associated with a foreclosure, whether it is by trustee sale or judicial decree. The debtor may also escape liability for any deficiencies resulting from a judicial foreclosure. When the parties agree to execute a deed in lieu of foreclosure, the transfer may be made by grant or quitclaim deed and may be done at any stage of the proceedings prior to the actual foreclosure sale. If you have been unable to make your monthly mortgage payments and have also been unsuccessful trying to sell your home at its market value, this form of foreclosure may be what is necessary to get you back on track. This procedure allows you to transfer your property voluntarily to your lender or mortgage company and often allows your debt or deficiency to be forgiven. This will not save your home, but it will help you with your chances of getting another mortgage loan in the future and it will help you avoid the lengthy legal process of a foreclosure. Although it is a negative strike on your credit rating, it is less harmful than a foreclosure. To get started with a free and confidential consultation, please contact our office toll free or via email to speak with a deed in lieu of foreclosure attorney in Beverly Hills.